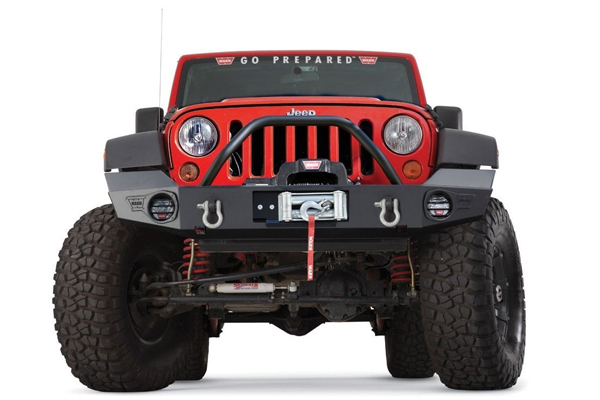 Truck Winch Bumpers, Jeep Bumpers | WARN Industries | Go Prepared. 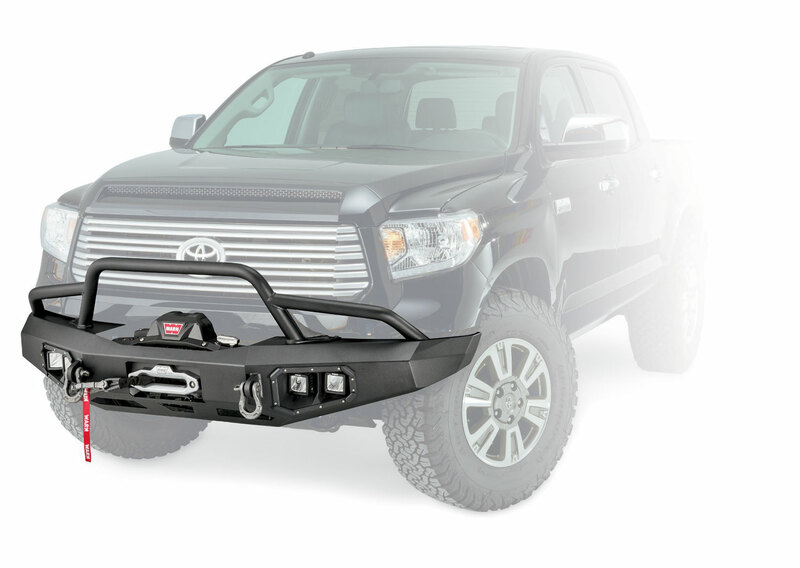 Whether you're on the trail, on an overland expedition, or just looking for a sturdy place for your WARN winch, a WARN Bumper is what you'll want. Designed, engineered, and made in the USA, WARN Bumpers offer the features you need with a great style that's perfect for the life off road. + Advanced Bumper geometry designed specifically to increase approach angles and articulation. When a WARN Ascent™ Bumper rides on your truck, you open up a world of possibilities. You get the look you want, the rugged functionality you need. Precision angles and a unique low-profile design maximize approach angles and optimize off-road performance. Plus, the WARN Ascent Bumpers come ready to fit the legendary WARN mid-frame winches—like the ZEON Platinum and a host of others. When it comes to integrated style and functionality, there’s nothing else like it, not even close. The WARN Ascent Rear Bumper is designed to sit high, maintaining maximum ground clearance and approach angles. The angled design with black finish offers a custom look, and delivers maximum off-road performance. 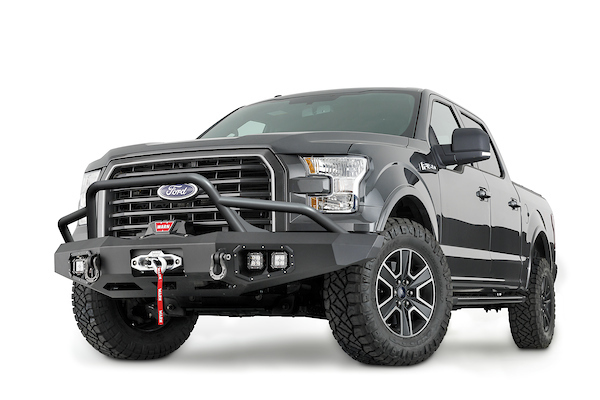 When you want the ultimate front bumper for your truck, you want the WARN Heavy Duty Bumper. These units are contoured to the shape of the vehicle’s grille and body and have that custom-made look. They offer excellent protection thanks to a one piece welded design that incorporates round light ports and a concealed winch mount. The WARN Heavy Duty Bumper is for the larger capacity WARN winches, including the 16.5ti. Whether you’re planning an overland expedition or just out exploring, these bumpers are designed for life off road. Features include a low, recessed winch mount for the ultimate winch protection, and a wrap-around design that offers strength and style. There are recessed ports and mounts for factory or auxiliary lights, and a welded-on CNC-formed grille tube for increased protection (optional). There are recessed jack points for increased recovery options, and eyelets for D-shackles. Mounting fasteners are hidden inside the bumper for a clean finish and reduced corrosion. The WARN Elite Series™ Rear Bumper has been engineered and built to be more durable and easier to use. It features raised corners for increased departure angles to maximize off road performance and has welded eyelets for D-rings to increase your recovery options. This bumper will work with the factory receiver hitch and can accommodate up to a 40” spare tire. The tire carrier uses a chassis-mounted pivot and has a tailgate-synchronized swing-out design. It can be easily opened with one hand, and takes the weight off of the tailgate. Plus, the unique anti-vibration design keeps things quiet on and off the trail. 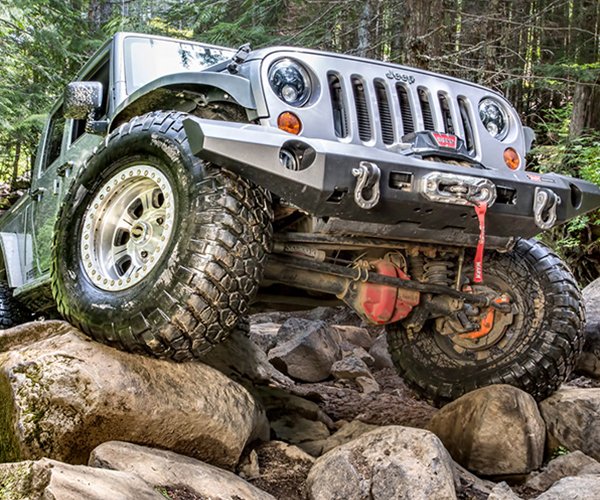 For those looking to equip their Jeep for serious rock crawling, WARN offers its Rock Crawler Bumpers. The standard Rock Crawler Bumper has high-clearance tapered ends for increased approach angles. The narrower Stubby version allows for maximum approach for increased off-road ability. Whichever you choose, you’re going to get an extremely durable place to mount your WARN winch and increased performance in the rocks. + Standard Rock Crawler Bumpers available for JK, TJ, YJ, and CJ. These tough, durable bumpers gives maximum off-road performance, thanks to tapered ends for increased departure angles. For increased recovery options on Jeep TJ, YJ, and CJ, there’s an integrated 2” receiver hitch to mount your portable winch or shackle bracket (not rated for towing). The Rear Rock Crawler JK Bumper features welded eyelets for D-shackles and a cutout for the factory receiver hitch. The WARN Tire Carrier for the Rock Crawler Rear Bumper is designed to carry a heavier wheel and tire, up to 37” in diameter. The carrier pivots on a robust 1–1/2” solid steel shaft pin that comes up through the bumper into the frame carrier. The shaft itself is welded – not bolted. Structural T-joint welds (vs. corner welds) will make this unit stand the test of time. A polyurethane pad reduces rattling. Includes frame reinforcing brackets. This bumper replaces the factory front bumper for increased off-road performance, durability, and style. These units showcase sloped vertical surfaces, which are tapered and welded. This is to maintain approach angles and not act like a plow in deep mud or snow. The bumper’s sides continue around to match up with the vehicle’s flares and style lines. Welded eyelets are ready for D-shackles and the winch mounting system is integrated and pull-tested for midframe winches up to 12,000 lbs. Made from 3/16” and 1/4” steel, and covered in a black powder-coated finish. Will mount the 9.5xp, XD9i, XD9, M8, and VR (does not fit ZEON). Not rated for tow-bar use. The WARN Rock Crawler Rear Bumper for the Toyota Pickup is designed with off-road performance in mind. The bumper sits high and tight, and is sloped to maintain approach angles and ground clearance. Welded eyelets will mount D-shackles, creating anchor points to increase your vehicle’s recovery options. These bumpers are built from 3/16” and 1/4” laser-cut steel, which is CNC formed, and robotically welded for excellent fit and durability. These units come finished in a black powder coating, and are compatible with factory and aftermarket rear receivers.